Come relax with us and enjoy the homestyle comfort and hospitality that began as a 200 acre family homestead in 1784 after being purchased by Michael Siegrist II, for his son John and newlywed Veronica Herr. Over the years many Siegrist families lived on this land until 1967 when Landis and Anna Siegrist sold the farm to young Amish farmers Elias and Verna Beiler. 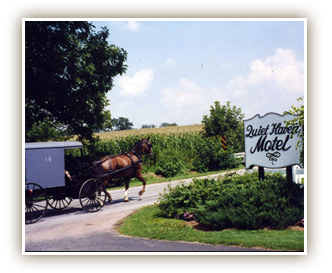 After building their new home on land they had once farmed, the Siegrist family built Quiet Haven Motel in 1969, on a piece of the original 1784 Siegrist land, now owned by ninth generation relative, Susan (Siegrist) Zimmerman and husband, Darrell Zimmerman. Take a walk along Siegrist Road and you'll stroll past Amish farmlands and meadows, past mailboxes with names like Fisher, Beiler, Esh, Stoltzfus and Siegrist on them. Pleasant View School, one of the first Amish schoolhouses built, is also along that road. At the corner of Eastbrook Road and Siegrist Road you will see the Siegrist-Groff Cemetery where descendants Christian and Esther Siegrist and three of their teenage children are buried. As you walk south onto Lynwood Road you will see Beiler's Orchards, the adorable alpacas, an Amish cemetery and Lynwood Amish schoolhouse. It's always great to see the cows in pastures or farmers working their fields, not to mention the many wonderful sights and sounds of the Amish countryside! 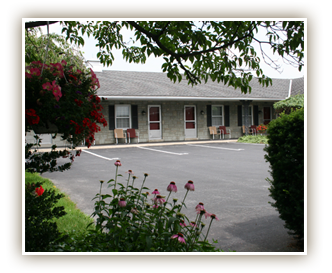 A relaxing stay awaits you at Quiet Haven Motel, fashioned from generations of history and hospitality. We hope you'll join us and become the next family to enjoy our piece of history, our Quiet Haven.